This article is an adapted from an Impark HEALTH white paper. To pre-order a free PDF copy, please fill out the form at the bottom of this page. Many healthcare leaders are understandably gravitating toward the Patient-Centered Value System (PCVS) as their operational playbook of choice. PCVS advocates for continuous performance improvement in a simple, practical, and easily executed manner that also neatly entwines clinical and financial performance. Crucially, PCVS delivers value-driven outcomes and experiences for patients, visitors, staff, and leadership. At Impark HEALTH, we believe key PCVS principles can and should be applied to your parking lot — and more broadly, your entry/exit experience — in order to match or exceed patients’ expectations from the very first touchpoint on your campus. 49% of healthcare executives say revamping their patient experience is one of their organization’s top three priorities in the next five years. PCVS redefines parking as a primary process in the healthcare chain that can facilitate better care, better health, and lower costs (the Triple Aim). In Bisognano & Kenney’s Pursuing The Triple Aim, PCVS innovator Dr. Anthony DiGioia emphasizes parking’s significance: “Human nature is that first impressions are important,” Dr. DiGioia says. “The first person you see and deal with at the hospital many times is the parking person. It’s important because it sets the stage for the rest of the experience.” Dr. DiGioia also established that a patient-first, co-designed parking experience led to an uptick in efficiency and productivity in the clinical sphere, including a reduction in operating room delays. By applying the PCVS principles of co-design and shadowing to your parking facility, you too can set the stage for operational excellence and a superior patient experience. PCVS focuses heavily on the concept of co-design — that is, designing the care experience in collaboration with patients and visitors in order to align their ideal healthcare experience with reality. This approach contrasts significantly with the traditional healthcare design process, in which project leaders quite often create and implement solutions in relative isolation. Co-design is a fluid concept that can be implemented in myriad ways. The partnership between healthcare provider and patient can, for example, take the form of interviews and panels, or longer-term communication streams like Impark HEALTH feedback terminals. Impark HEALTH’s feedback terminals allow patients and visitors to share real-time opinions about their entry/exit experience at the hospital. With this rich data set, Impark HEALTH is able to uncover patterns in patient satisfaction levels, allowing us to better target the source of consternation and make the necessary operational adjustments. For example, suppose Impark HEALTH feedback terminals indicate a dip in patient satisfaction between 2 p.m. and 3 p.m. every day for three days at a busy city hospital. Overlaying this with several key data points, we may determine a spike in traffic patterns as the source of dissatisfaction. Armed with this information, Impark HEALTH can then reassign an on-site ambassador to direct patients to available parking spaces when demand spikes, thereby reducing lead time and improving satisfaction – a simple and zero-cost solution for a problem that may not have been immediately obvious if patients and visitors hadn’t been engaged in the design process. Shadowing patients and families as they move through each touchpoint of the entry/exit experience enables healthcare providers to make direct observations and develop patient-first process improvements. This activity can be as simple as filling out Impark HEALTH’s parking facility self-assessment form alone or in collaboration with a patient or visitor. However, a comprehensive and complementary “mystery patient” program can also yield more organic and less biased qualitative results. “Seeing care through the eyes of patients and families enables us to map the current state of entry/exit processes, identify pain points, and lay the foundation for sustainable improvement,” Leonard Carder, Impark CCO, explains. “If there’s something in our service delivery that patients think could be better, we want to know about it, address it, and set goals accordingly. Impark HEALTH’s Mystery Patient Program, which can range from phone calls to extended role-plays with single or multiple participants, allows us to do that. Consumers are as likely to switch healthcare providers as they are a hotel if service is poor. Ultimately, healthcare providers deploying a full suite of multimodal feedback channels achieve the most valuable entry/exit experience outcomes. 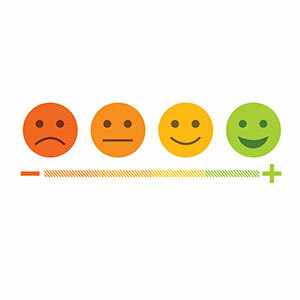 This feedback can then be actioned through a series of small, incremental, and easily managed primary process changes. The result? Doing less to achieve more. Known as “kaizen” in Japanese business philosophy, this will already be a familiar concept to those of you who choose to embrace lean management principles. The successful application of PCVS principles pivots on building a team of professionals that can take your healthcare facility from its current state to your patients’ and visitors’ ideal. That’s where Impark HEALTH can help. Our goal is to improve patient experiences across North America through the holistic implementation and management of patient-first parking, transportation, and wayfinding solutions. Our entry/exit design expertise and commitment to excellence has led us to partner with multiple hospitals featured on U.S. News’ 2017–18 Best Hospitals Honor Roll.